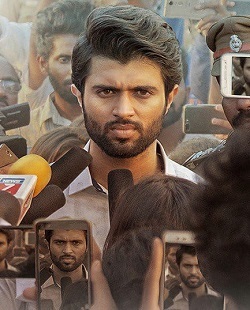 After tasting phenomenal success with films like Arjun Reddy and Geetha Govindam, young Tollywood star Vijay Deverakonda makes his way into the Tamil industry with this week’s release NOTA, directed by Anand Shankar of Arima Nambi and Iru Mugan fame. The film comes in as a political thriller, with a terrific supporting star cast that consists of Sathyaraj, Nasser, MS Bhaskar, Sanchana Natarajan, Yashika Aanand, Mehreen Pirzada and more. Prior to the release, we caught up with Vijay Deverakonda during his two-day stay in Chennai for the promotions of the Tamil version. Down below, are excerpts from the interview. The way it all began. I felt I was ready. I wanted to do something in Tamil because of all the admiration I was getting from here, but I didn’t have the balls to do it since I didn’t know the language. I actually had plans of learning the language, but I was working back-to-back and couldn’t get to it. When NOTA came to me, it was so relevant that I decided that I had to get on board immediately. People here deserve the film, it reflects what’s going on in this part of the country. I also thought that I could quickly learn the language through this. Your love for people here is too high. Do you find NOTA as a great way to reciprocate that? Yes, totally. When you see Obama’s wife wearing a saree, you go all wow and gaga over it. In the same way, when I wear a veshti or speak Tamil, I felt it would mean so much to the Tamil audience. I did curse myself and punch pillows sometimes for taking it up, but it was worth it. Picking the space of a political thriller in states such as these? Either I am incapable of thinking of these things, or I don’t care. My choices aren’t based on these thoughts. I see NOTA as a relevant film, and though it will set off some ripples, we will see what happens later. Just because people are sensitive, we can’t shut up. I realized that the politics in Tamil Nadu are cut off from the rest of South India, but there’s a reason for that. In Hyderabad, we can openly talk about politics publicly. But here, the public cannot voice out their ideas because they would be ‘sshhdd’ down. It happened to me too! Will you continue to do bilinguals? There are two other scripts that I really liked, they came to me as bilinguals. I loved it and said yes. But in the process of doing NOTA, I realized that it is a very tricky and tiring business. The work level is double, so it requires double commitment, energy and everything. I remember an incident from my dubbing process where I called it quits with Anand when he made me repeat ‘azhagu’ 40 times. It’s tough and saturating, so the whole thing should be worth the plunge. Talks about a film with Mani Ratnam were on, please provide clarity. There were some talks, but nothing got concrete yet. His latest film has released and I’ve seen the buzz being phenomenal. That’s all I can tell you.